Until recently, Lombok has merely been a “spill-over destination” for tourists from Bali. However, if one looked beneath the preudo-Balinese surface which Lombok has adopted, there is an indigenous culture waiting to be discovered. The heart of Lombok is the Sasak culture. The Sasaks, who are the indigenous people of Lombok, are Muslims. But there are no domes and arches which are often associated with Islamic architecture because such display of grandeur does not exist in Lombok. Apart from being more primitive, they live a completely different lifestyle from their Hindu neighbours in Bali. In the few remaining Sasak villages, one can observe the traditional lifestyle and daily goings-on in their genuine setting, quite unlike the “cultural shows” often frequented by tourists. Stripped down to bare necessities, the architecture in the Sasak villages accurately reflrects the lifestyle of these people. There is no intricate wood-carving, elaborate terra cotta sculptures or lush landscaping. What you see is just the purity of an indigenous architecture that has germinated from the seeds of nature, undisturbed by any form of decoration. In other words, one cannot expect to find beautifully adorned edifices like the temples of Bali. Instead, there are very basic houses that are representative of the Sasak lifestyle. 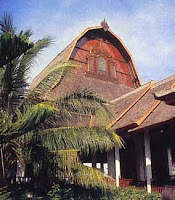 Ironically, it is this pure form of architecture that ends up as decorative features in the modern hotels which attempt to introduce some Lombok style into their built forms.